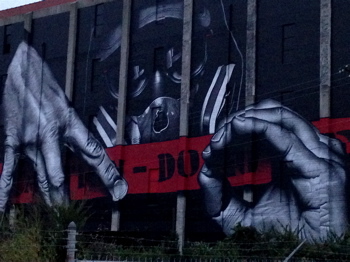 “My Name is MO,” by French muralist MTO. Originally installed as part of the annual PRHBTN street and art festival in 2014, it turns out this is an interestingly located political statement by MTO, to raise awareness that street artists try to bring beauty or attention to issues, often in otherwise dilapidated locations in need of a boost, but authorities mistake their work for common graffiti and treat the artists as if enemies of the state. Locals have been less than enthusiastic about the finished product. Some believe the letters the artist’s hands are signing in the image are gang symbols, instead of the rather obviously recognizable M-T-O, which is his version of a signature. But this reality hasn’t kept the ill-informed from spreading supposition that this “scary picture” will draw gang activity to the area, which has not been the case. I do like the simplicity of this statement. It’s a sympathetic take on the street artist as a messenger for the common man. This brand of art ferments many preconceived notions, prejudices, misconceptions and often injustices and distills them into a recognizable visual art form that can be displayed along everyday crossroads for all to see. Much like the theory behind the successful 21C Museum+Hotels, the brainchild of Louisville modern art collectors Laura Lee Brown and Steve Wilson, art was placed in the pathways of everyday life, whereby offering subliminal enlightenment into each person’s world who might pass by. The idea being that a provocative image can break up the tedium of walking to the bathroom or driving down an otherwise forgettable avenue. It makes you think. It makes you contemplate. It gets all those brain juices percolating when otherwise they would be numb. You just have to notice. The area on Manchester Street is known as the Distillery District. It is not some lovely tree lined street in a tony area. It is an outlying corridor connecting Old Frankfort Pike and New Circle Road to downtown. It primarily is composed of storage facilities, old warehouses, a police substation and the Lexington Fire Department’s training facility. Shangri-La it’s not, but the neighborhood is consciously trying to improve. Civic leaders and dreamers have the intention to lure visionary investors to this neglected strip so it might be repurposed. There are numerous classic facades that could be rehabbed into edgy office spaces, lofts or shopping areas. Some already have, but for the most part this area would be termed a work-in-progress with lots of potential. I can understand the dissatisfaction the owners of Kelly Nursery may have with the placement of this mural. Their business splays out beneath this towering image on the adjoining wall. The hooded character in sunglasses wearing an air regulator is a bit menacing for flower shopping. It looks like this giant may emerge from the wall at any moment, crushing the shrubbery below. On the other hand it’s pretty cool to have the natural beauty of a nursery next to an old warehouse with a menacing mural. It’s the tension created by these opposite worlds mixing together that generates a different kind of tolerant beauty. This image from MTO is a great fit for the Distillery District, with its tattered appeal and weathered buildings. Sure some may not get the true message behind what this mural is about, but give it some time and that to will change. Lexington is definitely a place where the comfortable could use some afflicting. With its genteel horse farms and manicured fences, it desperately needs some edge and an illusion of danger. This mural from MTO is potentially a rallying point for the Distillery District and something for it to build around. I applaud Lexington for taking a chance on this mural, and for its other recent architectural and public art installations that have made Lexington a much more appealing landscape. 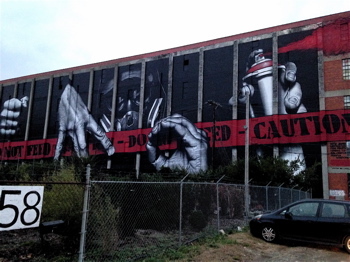 This entry was posted in News, Travel and tagged Distillery District, Lexington, MTO, Mural. Bookmark the permalink.